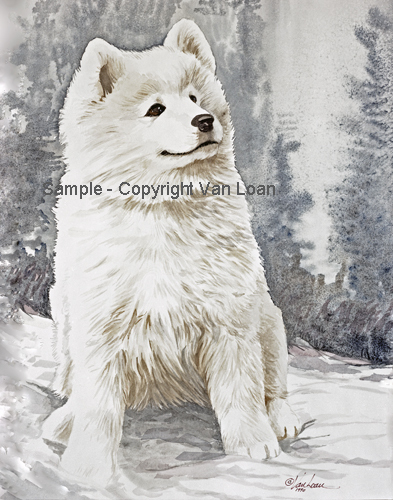 Samoyed "Puppy In The Snow"
Home > Working Group > Samoyed "Puppy In The Snow"
The Samoyed Puppy in Snow was created in Watercolor by the artist. This is a Limited Edition Print by Martha Van Loan, signed and serially numbered. The image size of this print is 11"x14" and it will fit into a standard 16"x20" mat and Frame which we have available in our Framing section to make this a special gift. In 2005 the balance of all our full color Limited Edition prints were converted to Giclee prints due to the change in technology used to create Limited Editions. We use the finest Pigmented Inks and papers which are of Archival quality with stable colors.